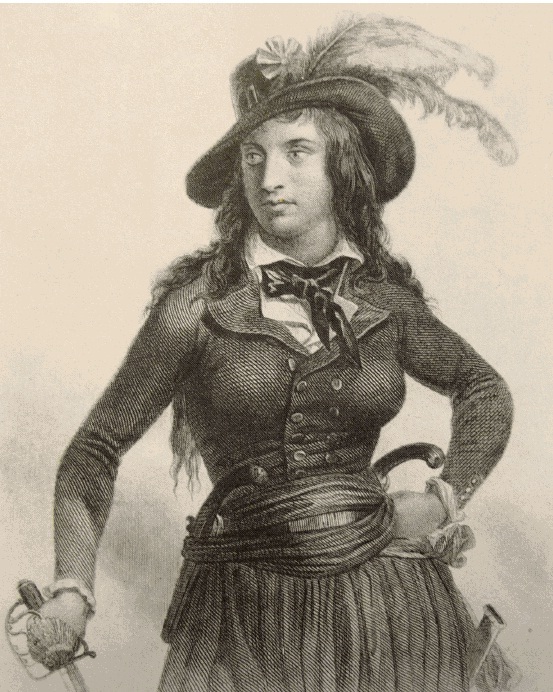 Of the women patriots of the French Revolution whose names are known, Théroigne de Méricourt (1762-1817), courtesan turned revolutionary, continues to fascinate. Although she participated in neither the storming of the Bastille nor the women’s march to Versailles, these events inspired her to political action. She was mythologized both during her lifetime and later by the Romantics as much for her beauty and provocative appearance as for her revolutionary deeds. Méricourt personified the revolution for supporters and foes alike. Idealized in works of art and vilified in satirical cartoons, she is depicted wearing overtly revolutionary accoutrements such as the cockade and Phyrgian bonnet, as well as the riding habit as everyday attire — a highly gender-transgressive act in 1789. As women stood the chance of gaining real political power, dress became more politically charged than ever before. By 1800, sumptuary laws were overturned, luxury no longer the privilege of a certain class. The shedding of the corset, a woman’s “armor,” was a further erosion of class boundaries, the wearing of armor a privilege previously accorded only to the nobility. As one of the earliest and most influential adopters of the riding habit — essentially a man’s redingote and breeches with the addition of a petticoat — as everyday attire, Méricourt was an early proponent, and possibly even the inventor, of women’s revolutionary dress. As Schama has observed, Méricourt is a “purified vessel for Revolutionary ideology,” a classical heroine standing for liberty, equality, and fraternity, she is also Baudelaire’s bloodthirsty “amante du carnage.” As the early idealism of the revolution and its promise of egalitarianism for all — women included — would be overshadowed by the Reign of Terror, Méricourt’s “un-feminine” militancy and call to violence would play a part in her downfall: she was ultimately declared insane and died in La Salpêtrière asylum. Through visual and literary sources and contemporary accounts, I examine depictions of Méricourt’s dress and appearance as symbols of the revolution and as sources of fashion history. Théroigne de Méricourt by Auguste Raffet. Bibliothèque Nationale, Paris. Original steel engraving drawn by Raffet, engraved by Bosselman, 1847. This entry was posted in Uncategorized and tagged French Revolution, History of Costume, Théroigne de Méricourt. Bookmark the permalink. Théroigne de Méricourt was famously one of the leaders of the March to Versailles. She was renowned and famous for her part in it. Simon Schama described her garb and part in that march, I believe within the same source you cited above. That aside, she was a revolutionary ninja, until the women turned against her and beat her for trying to define their ban on the balconies. You’re very intelligent. You recognize therefore considerably with regards to this matter, made me in my view imagine it from numerous various angles. Its like women and men don’t seem to be interested unless it’s something to accomplish with Woman gaga! Your individual stuffs great. Always take care of it up!